The 44th Annual Daffodil Festival on Nantucket starts today, and it couldn’t come any sooner! Winters on Nantucket are long, grey, and cold, and the Daffodil Festival heralds the coming of spring and the tourist season. 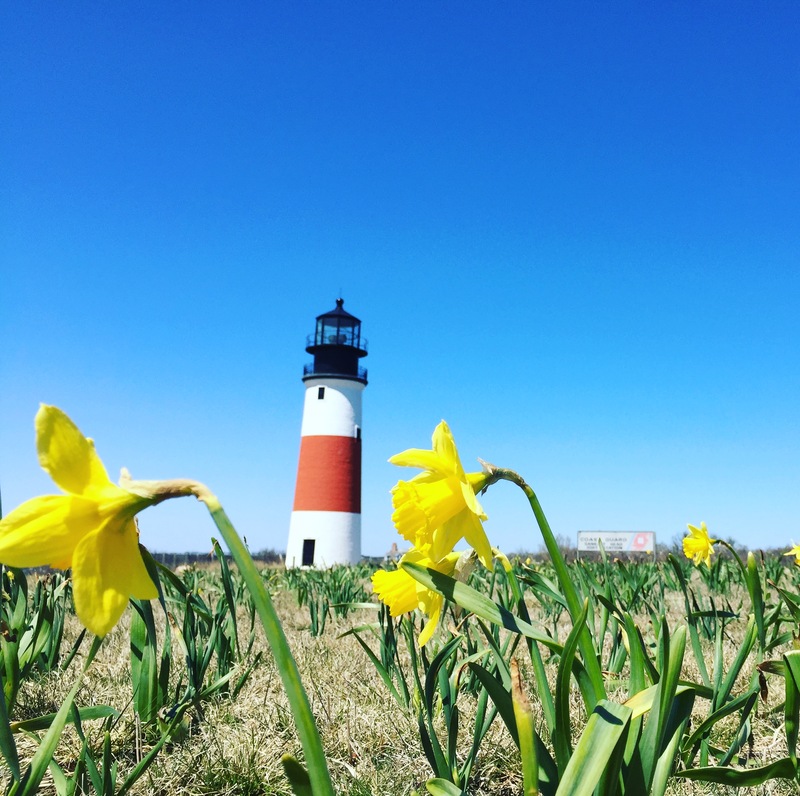 While the hundreds of varieties of daffodils that blanket Nantucket are nothing short of captivating, the true star of the weekend is the village of ‘Sconset on the island’s easternmost end. After the antique car parade, hundreds of cars (antique or otherwise) meander down Milestone Road to ‘Sconset for an island-wide tailgate picnic. As you admire the classic cars and creative picnic spreads, take a moment to feast your eyes on ‘Sconset’s famous cottages. 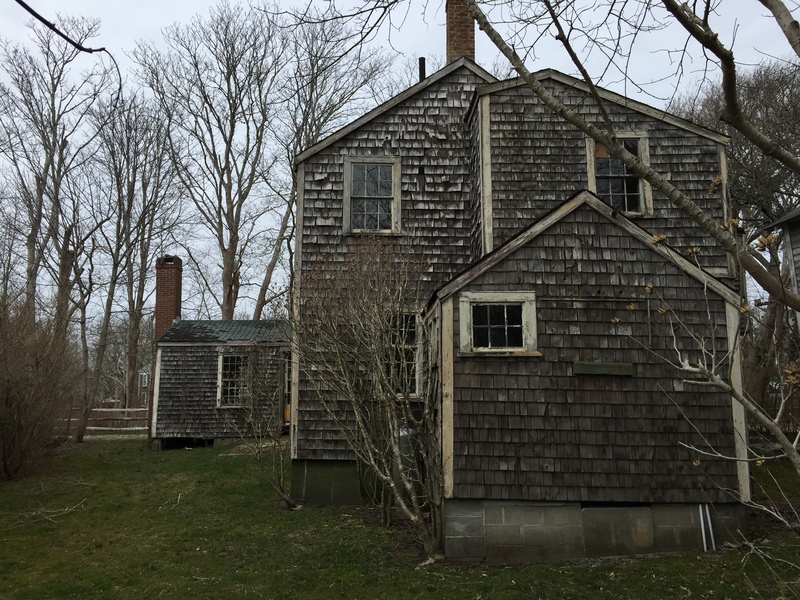 Many of these historic homes were originally built as fishing shanties before becoming summer retreats. 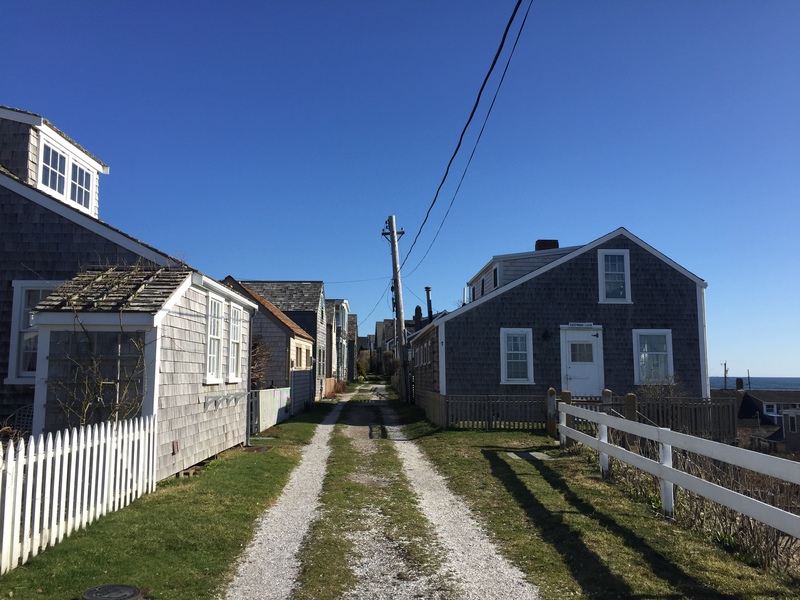 ‘Sconset’s tiny cottages are a reminder that bigger is not always better. 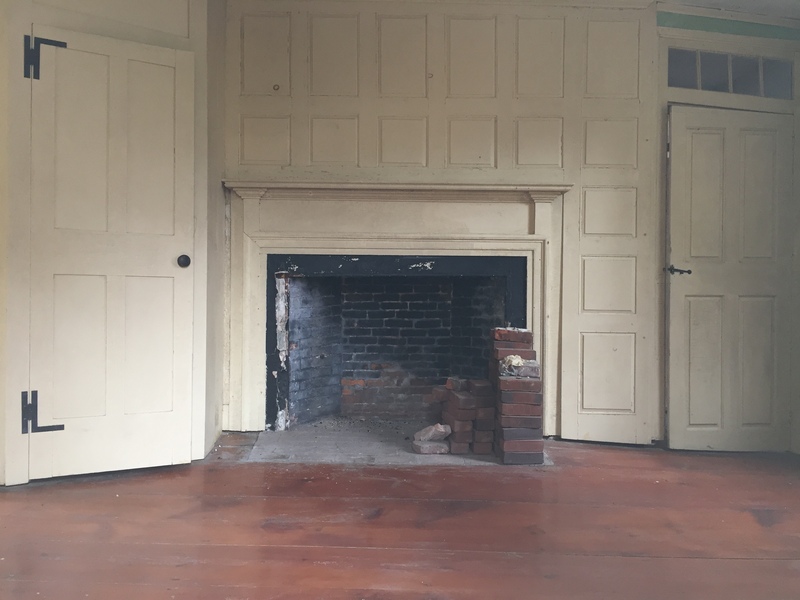 Interested in learning more about the cottages in ‘Sconset? You can read more about the Underhill Cottages here and 22 Broadway here. 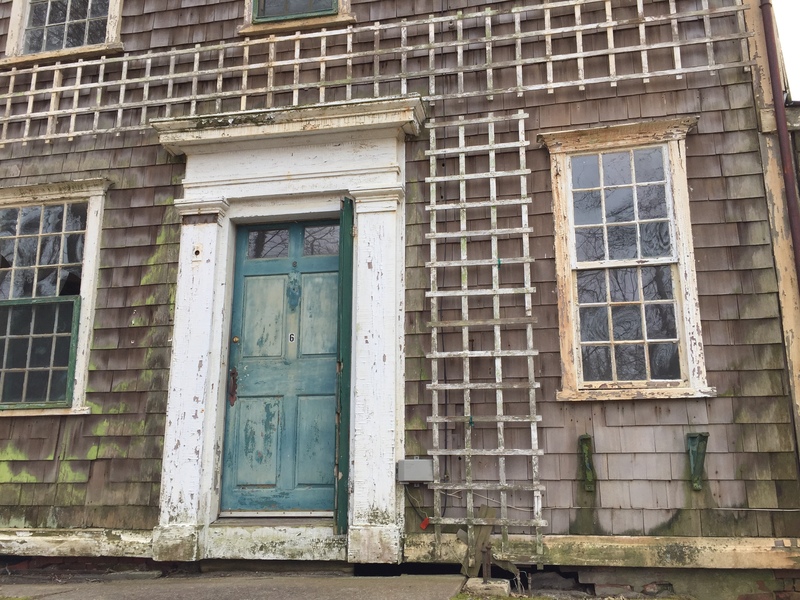 Be sure to keep an eye out for our 2018 walking tours of ‘Sconset when the weather gets warmer! Need some inspiration for your Daffodil Festival tailgate picnic next week? You’re in luck! 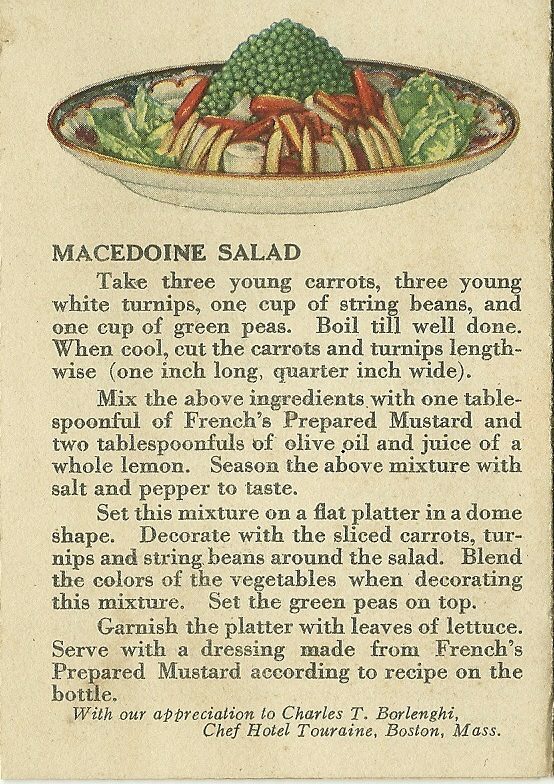 We’ve recently received a collection of vintage recipe cards, books, and clippings from the early 1900s to the mid-1940s. America’s relationship to food changed drastically during those 40 years. 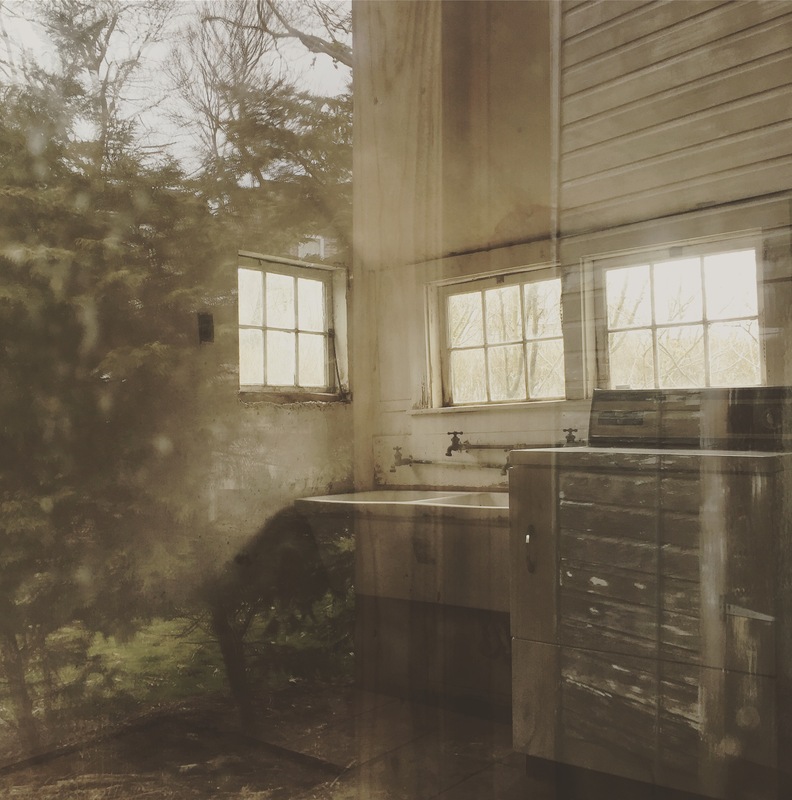 By the end of the 1930s, many homes had replaced ice boxes with modern refrigerators, ushering in a new era of “cooking with cool,” even on the faraway island. Gelatin and mayonnaise factor heavily into these recipes, creating savory or sweet salads for all occasions. GE “Monitor Top” refrigerator from 1927. Early refrigerators were smaller than the ones we have in our homes today (8.6 cubic feet of space for food compared to 18 to 26 cubic feet today). The design of refrigerators has changed. Once the centerpiece of the kitchen and a point of pride, today many favor appliances that blend in with their kitchen surroundings. Still, there are those who like the look of the retro “futuristic” appliances that hearken back to a time when refrigeration was a modern marvel. 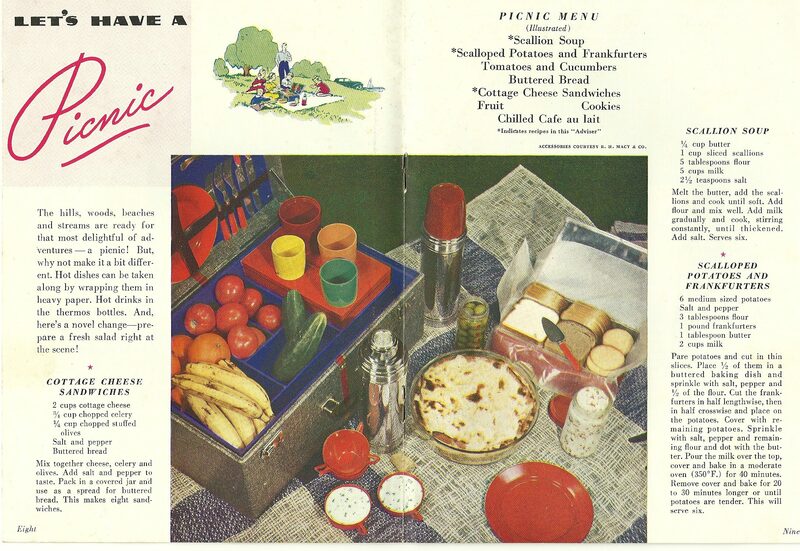 While you’re planning your ‘Sconset tailgate picnic, take a look at some of our vintage recipe finds. On Nantucket, we think about transportation more than most. Will the boats run in this wind, or will they be canceled? Will the planes fly in this fog, or will they be grounded? Will I find a parking space downtown? Transportation shapes the places we live, and the types of buildings we construct. Nantucket banned automobiles on town roads until April of 1918. Within 10 days of the repeal, 24 cars had made their way to Nantucket, and an auto dealership set up shop. The abundance of automobiles that followed allowed people to live further from the town center and the village of ‘Sconset. Before cars, Nantucket had a railroad that ran from 1881 to 1917. The railroad had a great impact on the way Nantucket was developed by land companies. Perhaps the best illustration of this impact is the story of the Surfside Hotel. When the railroad tracks first took the train to Surfside. By 1884, the train followed the south shore to ‘Sconset. With it’s ocean breezes, tranquil surroundings, and views that stretched on for miles, Surfside soon became a resort destination. All it needed was a grand hotel. Lysander Flagg, a developer in Riverside, Rhode Island, had such property built in 1871—the Riverside Hotel. 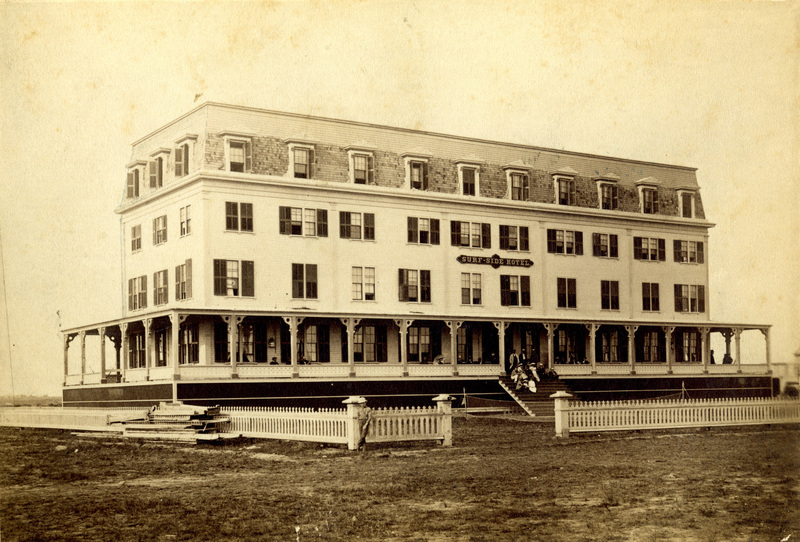 By 1882, the Riverside Hotel had been disassembled and transported on a barge to Nantucket. It took 34 carloads to transport the lumber to the hotel’s new site. From 1882 to 1884, the hotel was reassembled with a name that reflected its new location: The Surfside Hotel. This five-story grand hotel had a piazza and frequent band concerts. During the same time, the Surfside Land Company subdivided most of the area between what is now Surfside Road and the Boulevard. By the end of 1882, 180 individual lots had been sold. Unfortunately, Surfside really does live up to its name. Winter brought unrelenting storms and pounding surf, contributing to erosion and washouts that eventually forced the railroad company to close the Surfside and south shore section of tract by 1895. A new overland route to the rose covered cottages was constructed, running from Old South & Fairgrounds Road to Tom Nevers to ‘Sconset. With no automobiles allowed on Nantucket town roads, and no railroad to Surfside, the Surfside Hotel was essentially an island unto itself. In 1895, the back steps of the hotel were 265 feet from the bank. Nantucket’s south shore was losing an estimated 40 feet per year of beach at that time. The Surfside Land Company sold out the remaining 900 acres of land, at a loss, for $2.80 an acre. The many paper roads in Surfside are the result of the many subdivisions of land by the failed enterprise. In 1896, the hotel sold at auction for $650 to Mrs. Mary McClure of Boston. During much of 1897 and 1898, the hotel was advertised for sale in the Inquirer and Mirror. Just as the rails could not compete with the receding coastline, the vacant Surfside Hotel was no match for Nantucket’s winter storms. 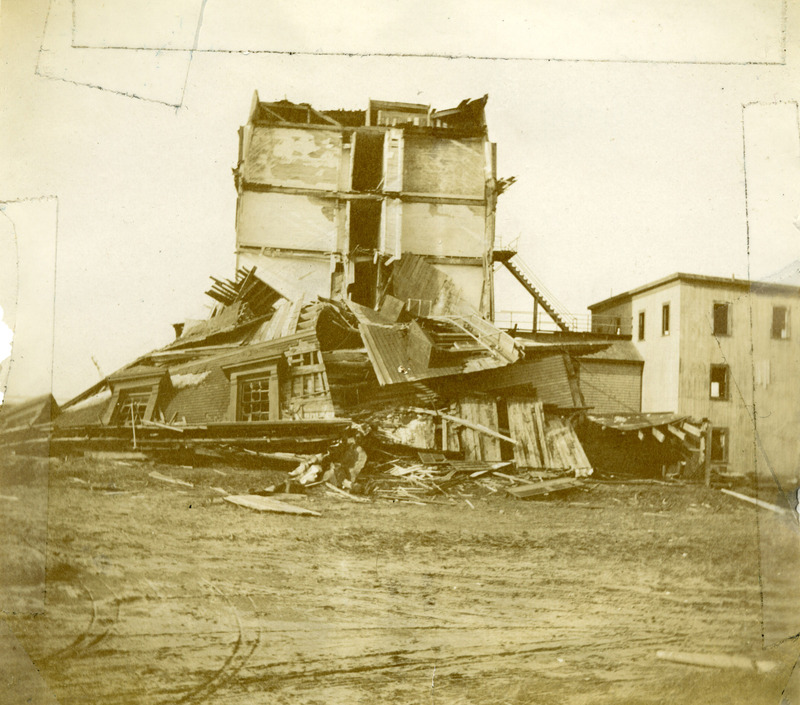 In December of 1899, part of the hotel collapsed in on itself.The abandoned and dilapidated hotel was now seen as a folly at best, a danger at worst. -Inquirer and Mirrror, Here and There, March 17, 1900.